Dreams can come true! 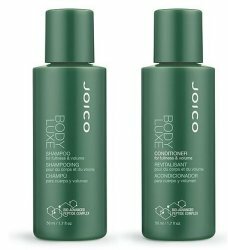 By using our innovative Body Luxe range of volumizing and thickening products, you transform your fine, limp hair into hair with bounce and volume. The Body Luxe range actually increases the diameter of each individual hair without adding any weight. Thickens each hair strand during the gentle cleansing process and contributes to manageability and conditioning. * Increased volume and body. * Limp, fine to normal hairtypes. * For those who crave thicker, fuller, more manageable hair.